Intended use: Conditioning runs, mid distance running. Upper: Single layer, elasticated 'Flyknit" knit upper. 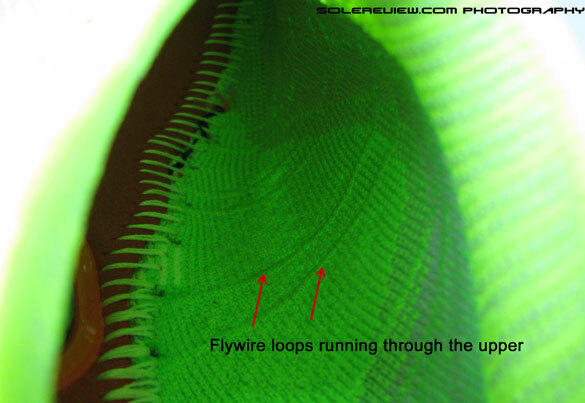 Flywire cord based lacing. Bootie construction. Midsole: Injection molded EVA variant. While it was inevitable that the Flyknit upper would make its way to the Free platform, the execution has been unexpected. Instead of slapping on the regular Flyknit upper, the new shoe features a highly compressive upper which results in a fit like none other. The only downside is the price, which at $160, seems a lot to ask for a deconstructed shoe. 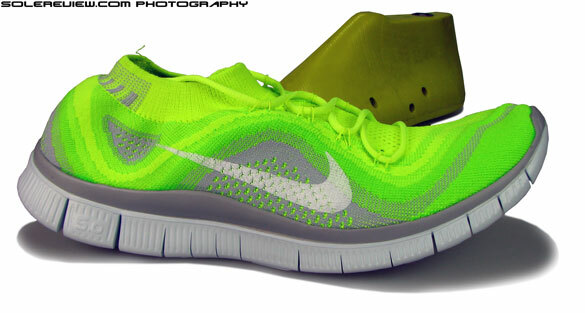 Opinions are easily formed, and by the time pictures of the Free Flyknit started showing up in blogosphere, we had ours. 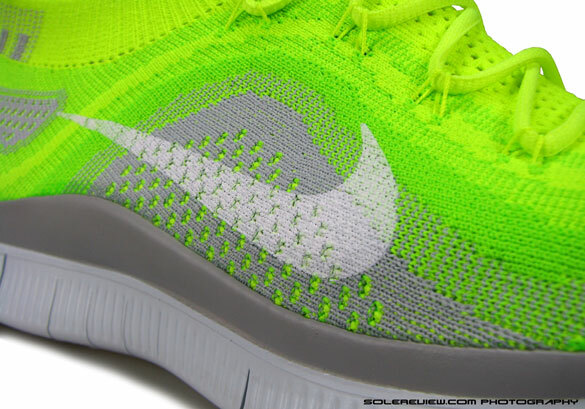 One look at a the Nike Free Flyknit, and we thought – ‘Ah, a Flyknit Racer upper on a Free 5.0 outsole’. As it turns out, we were wrong. On two counts. One, the Nike Free Flyknit does not feel anything like the Flyknits before it, and two, the real shoe out of the box looks nothing like those carefully manicured beauty shots. The shoe sits in the box curled up at both ends, the flexible Free outsole losing the battle with the elasticated upper. As a natural progression of the second relevation, we had a hard time photographing the shoe, while it behaved like a truant 8 year old kid at a dental check-up. More on that later, after we cover the important bits. Makes sense. A Free 3.0 might have scared off everyday runners, not to mention the extreme curling effect the upper would have had on the sole. The evolution of the Flyknit upper features all around knit compression helped by elasticated filaments threaded in the fabric layer, a tighter weave (compared to regular Flyknit) and variations in upper thickness depending on the area – toe vs heel, front vs sides and so forth. The key to all this, Sean McDowell explained, is the use of four different types of yarn as opposed to the single yarn used in the previous Flyknit versions. What does that sum up to? A fit which is like none other – it is hard to compare it to any other running shoe because an equivalent doesn’t exist. It feels like an Underarmour or Nike Pro baselayer for your feet, only a little more snugger. How does the Free Flyknit do that? Same way as a compression baselayer for your torso, it starts smaller than the actual body surface it has to cover, and has heavy duty elasticity so that it conforms to your foot shape once you slip them on. 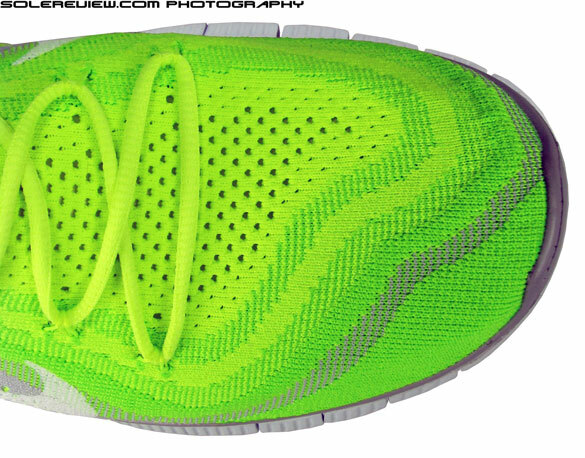 The Free Flyknit upper is narrowest in the midfoot to heel area, and this is the zone of maximum compression. Slip them on to your foot, and the lock down is instantaneous. The collar area is nothing but an knit, elasticated band which is half the size of the area it is supposed to wrap around. Slip these on, and the collar grips tenaciously around the ankle, with all the nicety of a nightclub bouncer. Back in the heel, a second layer of black, felt-like material lines up against your heel, placed there to prevent any potential blisters. The lacing is tricky, though. 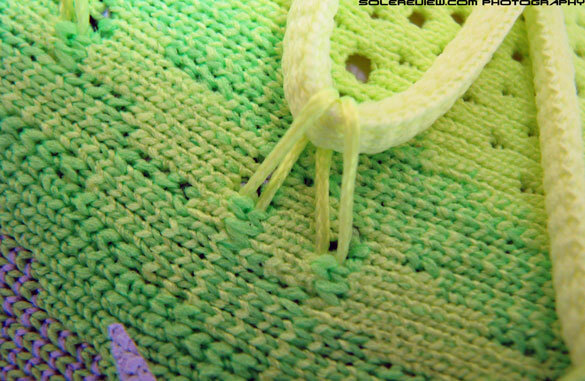 Thin, polyester cords loop out of the knit upper, and the laces pass through these loops. Tug on them tightly, and you feel the laces nervously straining against the loops. The loops look like as if they will snap, but then, these are polyester threads, capable of taking much abuse. But the next few months will tell if these loops and laces stand the test of time. Update, May 14th 2014: Eight months down, and the Free Flyknit has become one of our favorite shoes when going sockless. The loops haven’t broken, and the upper fits like new. The ride of the Free Flyknit is deja vu; no surprises here since the outsole is the same one used in last year’s Free Run 3 and last summer’s Free 5.0. Has generous flexibility and first timers on the Free might take some time getting conditioned to. However, move up, and that is where everything changes. All of the magic is in the newly designed Flyknit upper, and that is something that takes a few minutes getting used to. The Free Flyknit is everything a traditional running shoe is not. There is no tongue padding down on your instep. Soft collar lining and foam is replaced by a tight stretch band around your ankles. You can’t even wriggle your toes like you used to; the toe box, though more liberal in compression compared to the mid foot, manages to press down the forefoot. Due to the absolute lack of different layers and materials, the running experience is very unique. Running in a conventional shoe brings different areas of the shoe to life – soft tongue, padded collar, moulded heel counter, lacing pressure – but in the Free Flyknit, that is replaced by a singular sensation of all around compression. You don’t feel the upper twisting and bending as you run; all you feel is a tight, elasticated upper pinning your foot down against the insole. The lockdown is remarkable. The foot does not move at all even during sprited runs, and after a few runs in the Free Flyknit, we started wondering if the lacing had any function at all. So we took off the laces and went for another run. It turns out that the laces do add to additional grip, despite the puny looking set-up. 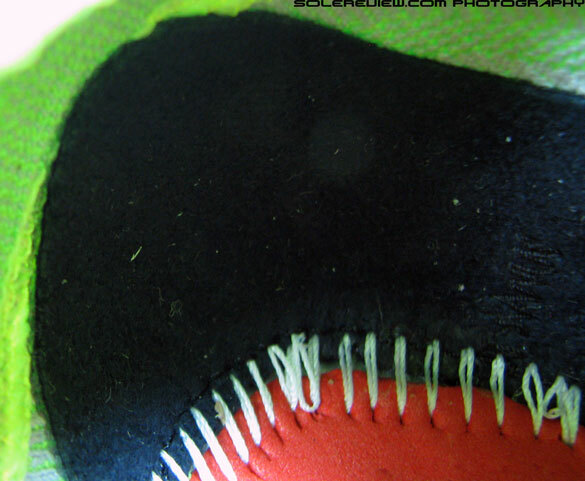 The small loops peeking out of the upper extend right down to the base (see picture below) so the laces tugging on them DOES result in fit change, and keeps the foot from moving sideways. But having said that, it is possible to run in the Free Flyknit sans laces as long as the running is in a straight direction at moderate speeds. 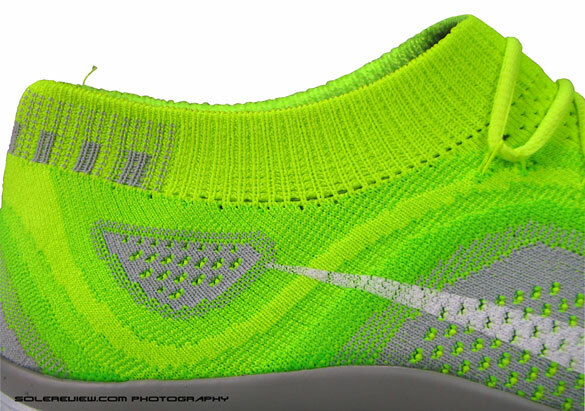 We took a picture (below) of the Free Flyknit without the laces; it does look cool. The sock like structure of the makes the prospect of running without socks very appealing, so that’s exactly what we did. After a few miles, we found out two things – one, the knit band around the heel rubs against the bare skin and results in a itchy sensation around the Achilles, and two, the sockliner (insole) fabric tends to stick to the bottom of your foot, more specifically in the forefoot area . Apart from the distraction, the foot tends to push the sockliner forward slightly over the course of few miles. But having said that, the Free Flyknit feels great without socks and laces, and this kind of usage should be good for short, daily fitness runs. 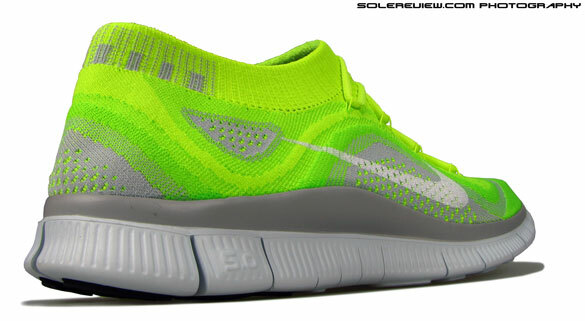 The sole unit is a now familiar Free 5.0 unit, seen on the last two iterations of the Nike Free 5.0. It has a muted padding, but good for quick touch and go. 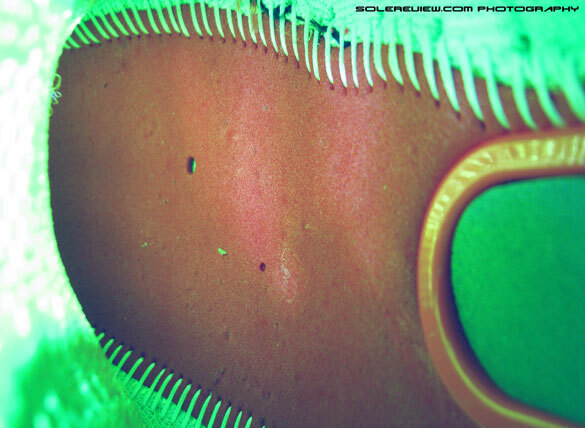 Multiple grooves cut across the surface of the sole, with the end result being amazing flexibility. First timers transitioning to the Nike Free should start building up the miles slowly – this will allow the foot to get conditioned to the increased range of motion typical of that sole unit. The sole is topped up with a Ortholite sockliner (same the Nike Free 5.0) which employs a clever technique to include the sizing label. Because of the stretchy upper, it would have been difficult to fuse or stitch the label on the upper. Instead, the sizing label has been stitched to the removable sockliner, and you can tuck it under and its stays out of the way. We have to mention that the Free Flyknit is ridiculously lightweight; one half pair of a size US11 comes in at a mere 225 grams. We are sure, if Nike had used a lighter sole unit (say a 3.0), the shoe would have been under an unprecedented 200 grams, a rarity reserved for the lightest track spikes. This results in a liberating running experience, the shoe weight barely noticeable during motion. The shoe also scores very high on ventilation, a natural consequence of the upper’s unique, single layer knit construction. Perfect for summer runs, but not recommended for rain or cold. There are few things which we were not happy with, and we’ll begin talking about them in that order. First is the price. The Free Flyknit ships out at $160, which is a lot of cash, considering the deconstructed upper and part sharing with the existing Nike Free 5.0. 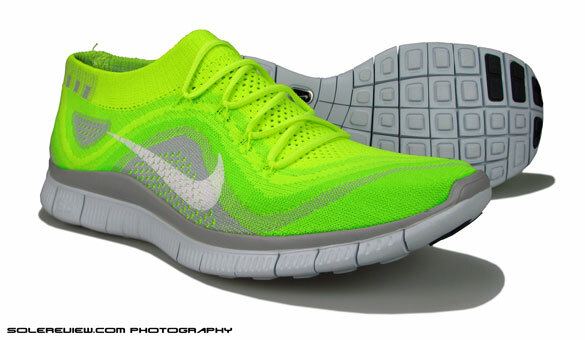 As a comparison, the current Nike Free 5.0 with the same sole unit sells at $100 retail. A $160 price tag makes the Free Flyknit more expensive than high end cushioned shoes (Glycerin, Nimbus, Vomero) with all the bells and whistles. So it is clear that the retail price plays a lot on the Free Flyknit’s novelty and unique fit proposition, while not necessarily being a better running shoe than a $100 product. Our second gripe is the lacing system. It does its job well, as it has emerged in our test runs. But the process of lacing will make an everyday runner nervous, with all the grinding which the loops go through when laced through tight. We’ve mentioned before that polyester threads are quite hardy and are unlikely to snap, but the lacing set-up is one potential area of improvement. Our third comment on the swoosh logo, which for third time (Racer, Lunar) is screen printed. 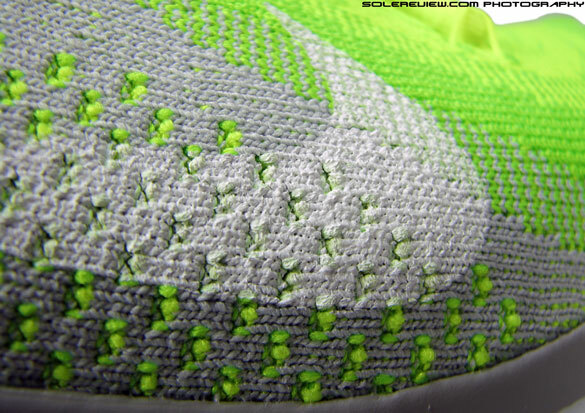 With the Flyknit upper evolving by leaps and bounds, surely there is a way to have the logo inbuilt into the upper? Not that screen printing has any functional disadvantage; but an integrated logo will just be a much appreciated area of detail. 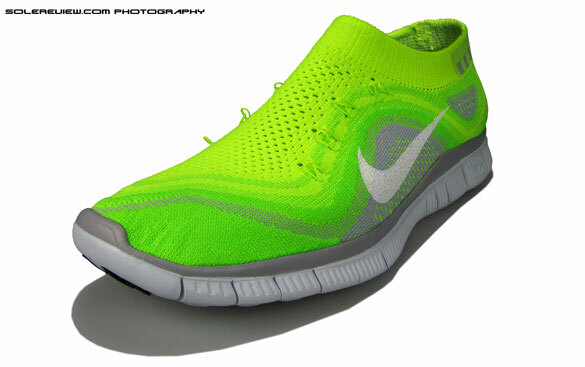 But it is clear that the Nike Free Flyknit plays on its strong merits. The new, compressive upper combined with the Free outsole is the ultimate expression of minimalist footwear design, or what Nike calls ‘natural motion’. It combines unique aesthetics, fit and feel in an overcrowded market, and that’s reason good enough to buy it.